How adopting an “American” diet can be detrimental for the health of many immigrants. Fig 1. 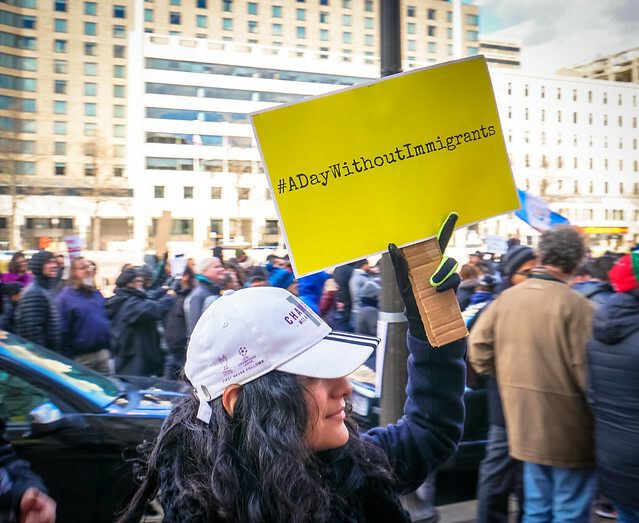 - The image above is from the “A Day Without Immigrants” march that took place in Washington, DC in February of 2017. Courtesy of Ted Eytan. Recently, I was catching up with my friend Rachel Haley discussing her senior thesis project here at UMass: Chronic Disease in Dominican Immigrants: A Comparative Study. In July, Rachel traveled to the Dominican Republic to do qualitative interviews with Dominican citizens living with chronic disease. That cohort will eventually be compared with a group of Dominicans living in Jamaica Plain, Boston. We discussed the various factors that may contribute to chronic disease and Rachel explained, using anonymous details, how immigrants in this country tend to have higher rates of chronic disease than their counterparts still living in their countries of heritage. This is significant because in 2016, there were more than 43.7 million immigrants living in the United States. This number accounted for 13.5% of the country’s population, with immigrants and their first generation children accounting for 27% of the US population. In order to decrease health disparities and improve overall public health, it is important to understand chronic disease and risk factors in this large portion of the US population . One theory that has been strongly attributed to the rise in chronic disease among immigrants as a whole is acculturation. Acculturation, as defined by the CDC, is “the process whereby individuals from one culture adopt the behaviors, attitudes, and values of the prevailing culture” . Could it be something in the environment, socioeconomic status, diet, or a combination of risk factors that leads to these higher trends of chronic disease? As we were discussing chronic disease, I couldn’t help but see a connection to the microbiome, as I study microbiology. The microbiome is a collection of microbe communities, composed primarily of bacteria, that are inside and outside the human body, including on the skin, gut, and oral cavities. I have read papers that investigate the bacterial breakdown of the gut, and its likely connection to digestive disorders, autoimmune diseases, mental health, and other chronic illnesses. Is it possible that the rise of chronic disease could be traced to a change in the microbiome in acculturated populations? I was curious, so I decided to do some research of my own. Through my research, I did encounter a key limitation. A lot of studies focus on chronic disease or the human microbiome in populations that generally are not comprised of racially diverse sample groups and often are not specifically targeted at immigrant populations. However, from the papers I found that applied to immigrant populations in the United States, or that I was able to extrapolate information about them from, I gathered the following information. A study published in 2014 based on the National Health and Nutrition Examination Survey from 2007–2010, primarily comprised of people of Mexican heritage, found that acculturation was associated with higher rates of diabetes in Latino populations. Acculturation level was determined using a 3-point scale concerning birthplace, English as a primary language, and time living in the US. As acculturation level increased, so did the prevalence of diabetes . I decided to further investigate the link between diabetes and the gut microbiome, and found evidence that the gut microbiome may have an impact on individuals developing Type 2 diabetes. Not only that, but long term dietary changes may have a major impact on gut microbiome composition . Food is expensive and food deserts are pervasive, so immigrants are frequently left without access to healthy sustenance. A USDA survey from 2016 found that as income rose per US household, the portion of total income spent on food decreased. Often new immigrants to this country do not have the foundation or resources to achieve financial security, as “immigrants comprise…one in four low-wage workers [in the United States]” . This means that immigrants often do not have many alternatives for their diet, and many end up developing chronic diseases like Type 2 Diabetes from consuming cheap Western food. Although the all Caucasian cohort in this study does not establish a causal relationship among acculturated immigrants, Western diet, and increased chronic disease, it’s definitely food for thought, and calls for further research. A second and older study from 1995 also looked at the role that acculturation plays as a risk factor for chronic disease, this time specifically with regard to Cambodian immigrants in the United States. Despite the small sample size, the researchers concluded from qualitative interviews that there was a correlation between adoption of Western diet by Cambodian immigrants and consumption of high-fat foods associated with various chronic diseases . Moreover, a 2015 study from University of South Carolina found that mice who were fed a high-fat diet had gut profiles unique from those who were not, despite having the same backgrounds and prior nutritional status. Similar results were found in humans in the same study . These studies seem to argue that even though US immigrants may come from the same country, with shared heritages and cultural practices, they can experience varying levels of chronic disease due to their degree of acculturation. The studies I focused on specifically related an acquisition of Western diet with chronic illnesses like diabetes. Importantly, they suggest that a lifestyle change could also be responsible for changes in gut profile. Ultimately, though, further research needs to be conducted on chronic disease in immigration populations, looking at acculturation and other risk factors in greater depth. Aydin, Ömrüm, Max Nieuwdorp, and Victor Gerdes. “The Gut Microbiome as a Target for the Treatment of Type 2 Diabetes.” Current diabetes reports 18, no. 8 (2018): 55. Dubowitz, Tamara, Dolores Acevedo-Garcia, Judy Salkeld, Ana Cristina Lindsay, S. V. Subramanian, and Karen E. Peterson. “Lifecourse, immigrant status and acculturation in food purchasing and preparation among low-income mothers.” Public health nutrition 10, no. 4 (2007): 396-404. Palinkas, Lawrence A., and Sheila M. Pickwell. “Acculturation as a risk factor for chronic disease among Cambodian refugees in the United States.” Social Science & Medicine 40, no. 12 (1995): 1643-1653. Murphy, E. Angela, Kandy T. Velazquez, and Kyle M. Herbert. “Influence of high-fat-diet on gut microbiota: A driving force for chronic disease risk.” Current opinion in clinical nutrition and metabolic care 18, no. 5 (2015): 515.